I remember an old Oprah show where viewers complained about a budget decorating tip--a bowl of lemons. "Don't you know how much lemons cost? Who can afford to let them rot?" Oprah retorted something to the effect of "Even I don't fill the whole thing full of lemons! Use some crumpled paper underneath and put the lemons on top!" I'm not fond of fake flowers, but I do use wooden lemons and porcelain oranges to bulk up the bottom of my fruit bowl. Unless it's delicate or very ripe, you don't have to hide all your fruit away in a refrigerator drawer. Pull three Granny Smiths out of the bag and line them up on the windowsill. 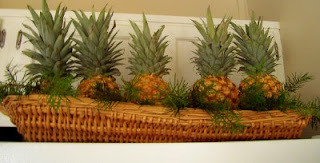 Only the extravagant could buy pineapples for decorating the top of a refrigerator. But since I have to cut these for Friday's breakfast, why not appreciate a basket of gold in the meantime? You've paid for it once--enjoy it twice! I like the idea of adding something under the fruit. I found a large, cool wooden trough shaped bowl this fall. It works great for holding a lot of fruit...one time recently I filled it with red and green apples to be kind of Christmasy. The other bonus of displaying with fruit - hopefully it will encourage family members to eat more of it! I tend to forget the stuff that is hidden in my fridge - so if the fruit is out, it brings it to remembrance. It might "ruin" my display a bit - but the healthy eating is more important. Besides if the fruit is out then the kids ask for it which I love to encourage. I came across your blog a while ago and love it. This is such a cute idea I would not have thought about it. I will have to try it. You have inspired me more than you will ever know. I love your blog and have read through all of your postings. Thanks for the excellent tips and teaching me that living on a budget doesn't mean depriving yourself and not have a wonderful cozy place for your family. I enjoy displaying as much of my fruits and veggies on the kitchen counter as possible. Either on my Japanese sushi plates or my retro family scale. Plus it reminds you that there are better things to snack on than crackers and chips because they are right out in the open. 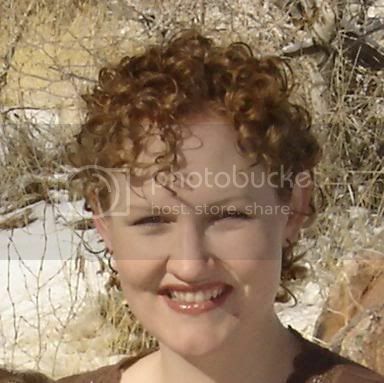 I am answering the phones today for a small insurance agency which gives me a lot of time to read blogs! I've spent all morning and afternoon reading your archives and I just wanted to say THANK YOU for all of the great information you give your readers! I love your ideas and they are SO usable!! God's blessings to you! 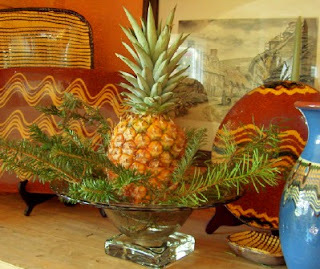 Pineapples are pretty-and you can grow your own as a potted plant, so no worries about rotting. You never cease to amaze me! Beautiful!